Next! 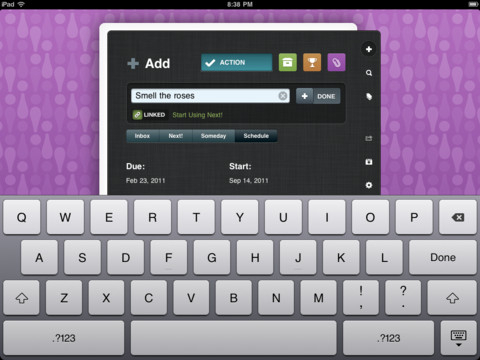 By LeftTurn Labs LLC is an application designed for the iPad that is meant to further organize and simplify your life. For those who are experienced with productivity apps and wish to improve their organization Next! may be just what you are looking for. Next! has three main sections which can all conveniently be accessed by a tool bar in the lower right corner. These sections are Actions, Projects and Goals, and References. Actions consists of the items on your to do list with tabs for the different tasks you need to complete. These tabs include next (the items at the top of your to do list), scheduled (anything that has a specific due date for when it needs to be completed), someday (non urgent tasks), and lastly your inbox for storing tasks that you are unsure where to put. 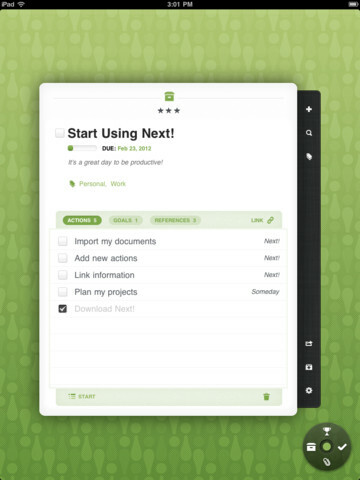 The Projects and Goals section is nice because you can link tasks in your Actions to different projects. Perhaps the greats feature of Next! is the References section which holds any attachments you upload to it. You can then link these attachments to any Action, Project or Goal. In the References section any document, picture ect. that is compatible with an ipad can be uploaded. This will allow you to have all of your files in one place and will simplify your organizing if used properly. Next! is also linked to the ipad notification center so you can set it to notify you when a task has an impending due date. It also features a search option allowing you to easily locate and task or references you want to find. Next! is priced at $9.99 which is a fairly high price for anyone that is not sure they will use it. The interface of Next! is not one that’s beginner friendly. It is definitely meant for users who are accustomed with task and productivity apps. If you are looking for an application that simply just has a to do list Next! is not for you. However, Clear by RealMac Software is a good alternative for a more straightforward to do list application. Next! receives four stars for its ability to integrate references into the app. It opens many possibilities for simplifying task managers and is something to build on. AppSafari review of Next! was written by Laura Zito on March 23rd, 2012 and categorized under App Store, iPad apps, Notes, Productivity. Page viewed 5352 times, 1 so far today. Need help on using these apps? Please read the Help Page. I have used a lot of productivity apps and Next! has a ton of really cool features and the navigation is really interactive and slick. The other thing that I love about Next! is that the people at LefTurn Labs (the creators) take feedback and incorporate into the next release. It is nice to have an application that improves over time and does not cost anything extra. The $9.99 I spent a few months ago has been worth every penny!